Archery involves shooting at a target with a bow and arrow for sport, hunting, or warfare. 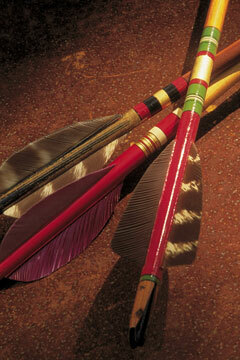 Basic archery equipment consists of a bow plus a quiver of arrows and a target. Bows are usually made of wood, fiberglass, graphite or carbon composites with a taut cord connecting the curved ends. Arrows are constructed of aluminum or carbon graphite. They are pointed at one end with stabilizers at the other end, and they feature a notch fitted to the bowstring. The arrow is propelled when the archer pulls it back with the bowstring and then releases it. Japan Times. Friday, 29 Mar 2019 19:23:45 +0900. Morgan Gstalter. The Hill. Thursday, 28 Mar 2019 23:16:10 +0000. Archery's longevity has been documented by ancient arrowheads made of flint and detailed archery carvings found on cave walls in Spain. The bow and arrow were utilized by the ancient Egyptians for hunting and warfare around 5000 years ago, and the Old Testament makes mention of archery used by the ancient Hebrews. Archery was gradually replaced by gunpowder for warfare, but it is still used as a means of battle in South America and central Africa. As a sport, archery was popularized in England and introduced in North America in the 17th century. The United Bowmen of Philadelphia, active from 1828 to 1859, was the earliest organized club of sport archers. The National Archery Association of the United States was founded in 1879, and it held the first archery tournament in Chicago. Archery competition includes target, field, and flight shooting. Target-shooting tournaments feature an event called rounds, with circular bulls-eye targets made of paper pinned to straw mats. The bull's-eye is suspended 4 feet 3 inches above the ground, surrounded by rings of gold, red, blue, black, and white, and assigned different point values from 10 to 1. The objective of flight shooting is distance rather than accuracy. Archery was an Olympic sport in the early 1900s, but it was not featured again until 1972 at the Munich Games. It features a ranking round, an elimination round, a finals round, a team elimination round, and a team finals round. Sixty-four archers shoot concurrently at targets 230 feet away in the individual events, and the competition is held according to International Archery Federation (FITA) rules. 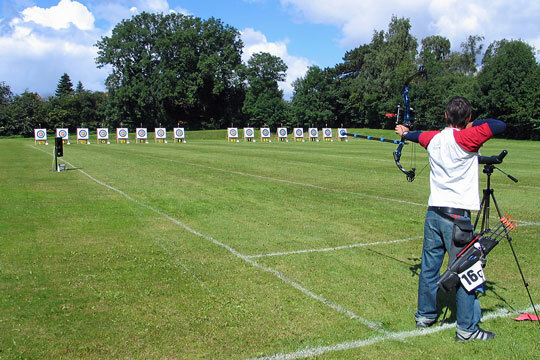 Founded in 1931, FITA is the international governing body of archery; FITA promotes and regulates the sport of archery worldwide. Founded in 1939, the NFAA is a non-profit corporation that is dedicated to the practice of archery.